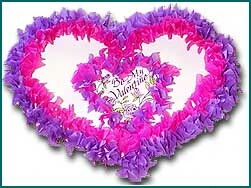 These make great Valentine's Day cards or decorations, and they're easy to do! 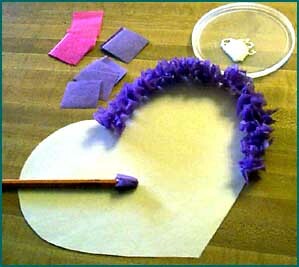 Draw a large heart shape on your piece of construction paper. Cut it out if you want. Pour a small amount of glue onto a plastic lid or piece of newspaper. Place the pencil eraser in the middle of one of the squares of tissue paper. Wrap the tissue paper around the end of the pencil - allow it to wrinkle. Dip the end of the pencil/tissue paper into the glue, then press it down on the construction paper. Lift the pencil out gently, leaving the tissue paper on the heart. Continue in this way until you have your heart completely decorated. You can work in rows, using different colored tissue paper, or just place the tissue on any way you want. NOTE: If you want to put something in the center of your heart, like we did here, we recommend glueing or drawing it BEFORE you start placing your tissue squares. It's much easier that way.